After the massive flood in Thailand, Honda Thailand recently posted a video in YouTube to show off the quality and standards that Honda has actioned. The car assembler will be scrapping 1,055 new cars. 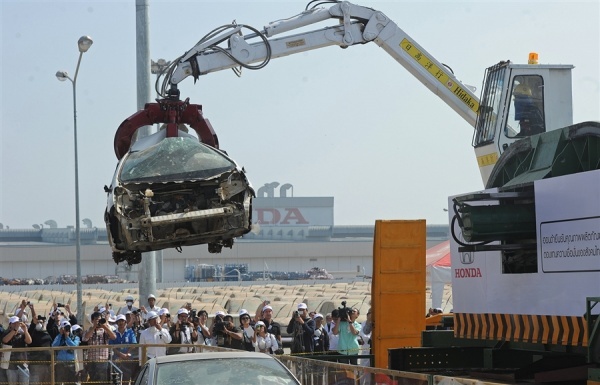 According to the Honda Thailand, the damaged cars and parts due to the flood will be dismantled, destroy and recycle. As a result, there will not be any refurbished cars and parts circulating in the market. If you happen/plan to buy a new Honda vehicle that is assembled in Thailand, it will be a new car for sure. Well, I am now wondering how Toyota Thailand handles those damaged vehicles.